On Saturday October 15th, in Cincinnati we had the Books by the Banks festival and…I was on a panel! Cincinnati librarian Sam Bloom invited me (thanks again, Sam!) to join him and authors Greg Leitich Smith & Zetta Elliott on a panel about the state of diverse children’s books. Education Librarian Edith Campbell was in the audience. On the morning of the festival, we squeezed next to each other at a small table in a small room…but the feeling was warm and inviting. 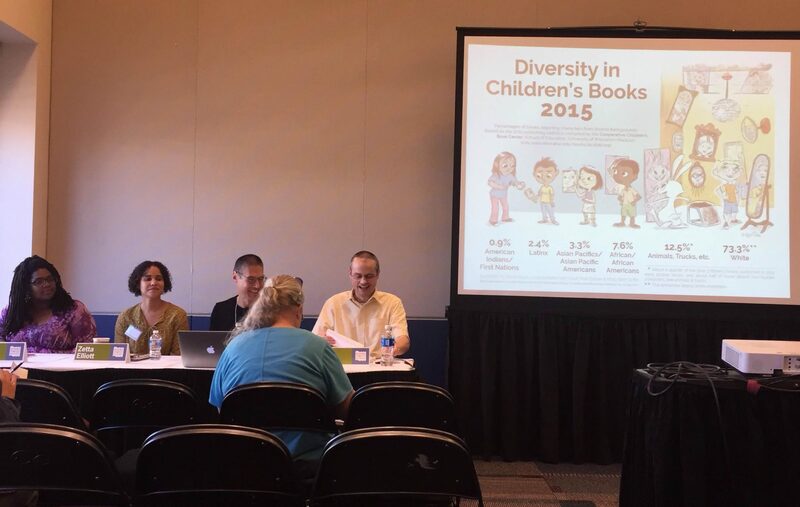 There were about twenty people in attendance and Sam began the panel by asking us about the newly released infographic about diverse books. The white child in the infographic has lots of mirrors and sees himself in every type of role; even a rabbit sees itself more than the children of color and the Native child. Though Sam had a few questions to guide us, the panel was mostly open discussion with a few audience members chiming in. Click to view in more detail! Zetta had really important points about how the system needs to be changed. She said we need more people of color in publishing who will speak up and we need more people of color engaging in community based publishing/self-publishing! I talked about the importance of #ownvoices. We have more books with children of color on the covers but still not enough authors of color. Sam asked me about my interactions with white customers in my bookstore; how often do they turn down diverse books if they’re offered to them? I said that very often diverse books don’t make it to the check out. Greg Lietich Smith said that he feels that publishing is too centered in expensive New York City and people from upper classes (usually white) are the ones who can afford to be there and take unpaid publishing internships. Zetta and Greg both believe we need more regional publishing. Zetta also touched on the need for reparations in the kid lit community. Read more about that here. We also talked about the makeup of kid lit awards committees. Good times. Can’t wait to do it again.